Whether your cabinets need a facelift or you just don't care for their color, you can save a considerable amount of money by refinishing the surface of the wood instead of replacing the cabinetry as a whole. Red and white oak are common cabinet-making materials, according to the Oregon State University Extension, so there's a decent chance that the wood with which you'll be working is oak. Choosing a different color of stain to apply to the oak cabinetry is the most basic part of changing its color. Employ the proper procedure to make your oak cabinets look fresh and professionally refinished. Give your oak cabinets a facelift will some effort and new stain. Remove all hardware from the cabinets with a screwdriver. Door pulls, handles and hinges must all come off. Set the cabinet doors and drawers aside. 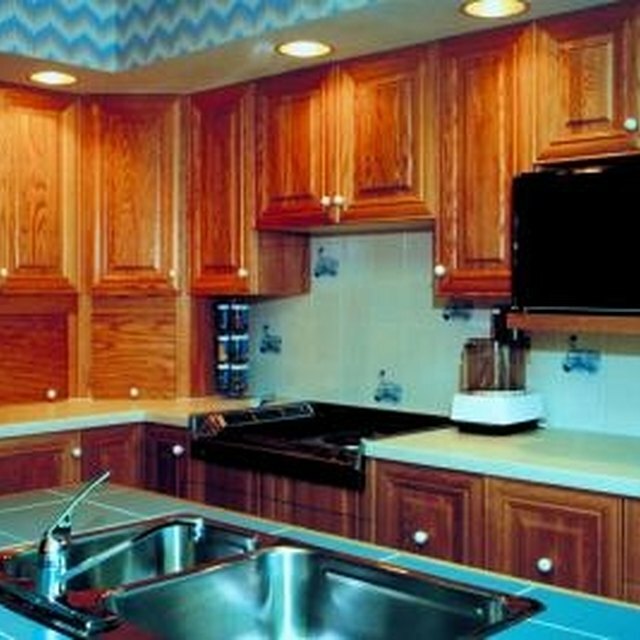 You will refinish them while they are not attached to the rest of the cabinetry. Tape off all areas that you do not want to modify with painter's tape. Walls, backsplashes and the ceiling are just a few examples of surfaces that you do not want to touch with stripper, stain or finish. Lay a drop cloth on the floor or another surface. Place drawer and cabinet fronts on the drop cloth. Don gloves to protect your hands during the remainder of the process. Paint a thick coat of chemical stripper on a section of the oak wood. Allow it to sit per the manufacturer's directions. After the recommended amount of time has passed, test the stripper's progress by lightly scraping some of the stripper and finish off with a putty knife. If the knife easily removes the finish, you can proceed. If not, wait a few more minutes before testing again. Scrape the finish off gently with the putty knife. Do not mar or gouge the wood. Dip steel wool into the stripper, and use it to remove the finish from difficult-to-reach areas. Repeat the stripper application and removal process on the remaining sections of cabinetry, including drawer and door fronts. Wipe the stripper residue away with a cloth dampened in water or turpentine, depending on the stripper's label directions. Allow the cabinets to dry. Sand the cabinets with 120-grit sandpaper to remove any remaining paint or stripper residue. Progress to 220-grit sandpaper to smooth all surfaces of the oak wood. Wipe the wood with a cloth dampened in water to remove any dust. Allow it to dry. Stir the combination stain and polyurethane with a stir stick. Do not overmix it as you don't want to add air bubbles. Dip a paintbrush into the can, and apply a smooth, even coat of the mixture onto the oak cabinets. Begin with any grooves on the cabinet fronts before proceeding to the flat surfaces of the cabinets. Allow the color and finish to dry. Apply another coat in the same manner if you wish to deepen the color of the stain. Let all parts of the oak cabinets dry completely. Reinstall the cabinetry hardware, putting drawer pulls, hinges and doorknobs back in place at the same time as you put the drawers and doors back onto the cabinetry backing. Michelle Skidgel has worked as a writer and editor since 2001. She earned her Bachelor of Arts degree in English at Oklahoma State University and is currently raising and homeschooling five children with her husband. Her articles for various websites specialize in parenting, green living, gardening, cooking and frugal living. How Do I Strip Stain From Kitchen Cabinets?